On February 1st I will open registration for The Homeopathic Midwife, an online professional training program in Homeopathy for Midwives. On the first of each month a new session will begin. If you would like to be put on the list for the program please email me and I will notify you as soon as registration opens. The focus of The Homeopathic Midwife is experiential learning, figuring out how to use homeopathic remedies during pregnancy, labour and postpartum. It is appropriate for anyone with a desire to learn. The program is specifically relevant for Midwives and Midwifery students. Homeopathy students, Doulas and Naturopathic Doctors may also find this information beneficial if they are attending births in this capacity. The program is divided into five modules and is paced to occur over a five month period of time. a flexible schedule of Skype calls to discuss and improve comprehension through case conferences. As you finish each section you will be asked to complete a clinical assignment to assess your assimilation of the material. The completion of these segments will result in a certificate of completion at the conclusion of the program. Please note that these assignments are experiential and practical. The fee for this progam is 1500.00 CDN funds. Learn how to gather the information you need to prescribe accurately. This will be demonstrated in a variety of settings. Selection of dosage and potency, which homeopathic pharmacies to use and time frames for prescribing. Homeopathic philosophy and development of language to have an effective informed choice discussion. Remedies are divided into categories of plants, animals and minerals so that you may study the remedy descriptions with classification. Each remedy description is specifically oriented towards its use in pregnancy, labour and postpartum care. Information will be accompanied by relevant clinical notes and clues when possible so that the connection between the written description and the real life client can be made as easily as possible. 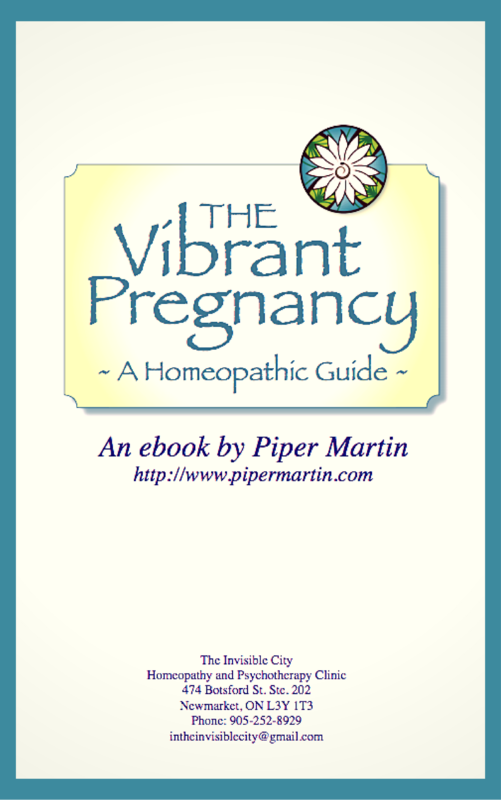 Common ailments of pregnancy that may benefit from homeopathic support are included in this segment. Symptoms such as morning sickness, dehydration, iron levels,acute illness and accidents are all covered, as well as emotional states such as anxiety and fear around upcoming births. Discussion will include treatment for previous birth trauma, VBAC women and sexual abuse survivors. Case taking in labour, how to translate what you observe into a remedy prescription. Homeopathic induction – so amazing! Homeopathic augmentation, remedies for first, second and third stage of labour – both physical and mental/emotional treatment. Remedies for the immediate postpartum – retention of urine, shaking, dissociation etc. Birth trauma recovery and emotional support for mothers. I will look forward to hearing from everyone who co-created this new experience. This is amazing! Are you in BC now? If you are ever around Squamish/North Shore Horseshoe Bay Area let me know i would love to meet :).